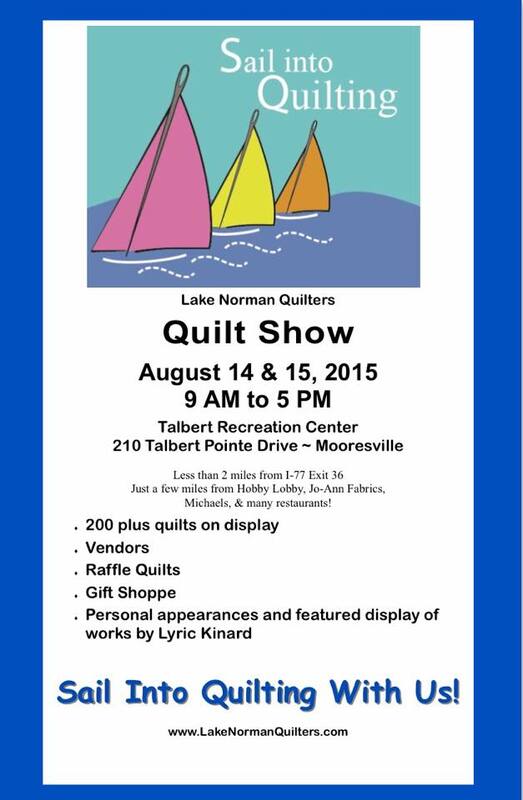 The Lake Norman Quilt Guild presents Sail Into Quilting 2015 quilt show this Friday and Saturday, August 14 and 15, 9 AM to 5 PM at the Talbert Recreation Center, Talbert Road, Mooresville, NC. Come see 200 quilts! I am always amazed and impressed by the high quality of work the members of this guild produce. You will not be disappointed. And there is a style for everyone: Contemporary, Art, and Traditional and a Log Cabin challenge display.. There will also be a gift shop with hand made creations, books and too many goodies to list. Vendors will also be at the show so that you may get all your creative shopping done! Bringing a significant other and don’t want him/her to get bored? A Girl Scout troop will host a café with beverages and snacks. What better way to spend a day! Posted in Art, Color, Fabric, Projects, Quilt Show, Quilting, Quilting Vendors and tagged Art Quilt, Fabric, guilds, projects, Quilt Show. Bookmark the permalink. Would love to meet you! This show will not disappoint!